These may be the Sunny Boy inverters you have been waiting for. The new Storage inverters from SMA have been designed as an intelligent interface between PV, the electrical grid and high-voltage batteries. The Sunny Boy Storage 3.8-US, 5.0-US and 6.0-US inverters can be used two different ways. 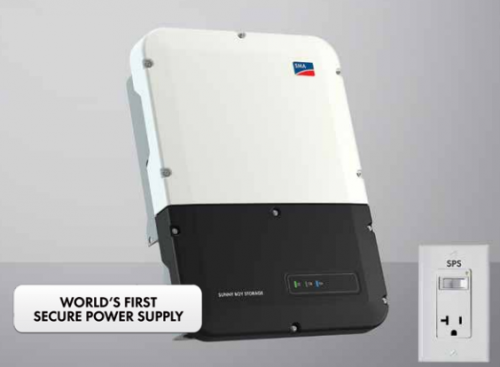 You can use these inverters when installing a new system, or you can adapt an older inverter system to Storage by AC coupling the SMA storage to your inverter’s AC output. The Sunny Boy Storage inverter acts like a controlled AC to DC converter to carefully charge a 350-550 volt Lithium Ion battery. A Lithium battery has a long life expectancy, does not give off dangerous fumes, is lighter and maintenance free. Lithium batteries come in many sizes and a standard Li-Ion battery for solar PV storage would typically be about 9 kilowatts. In the event of a power outage or grid failure, most households can usually get by at night with 9 kilowatts of power. The lithium battery can then be recharged by solar power the next day. A Tesla Powerwall would be compatible with this inverter or one of the high voltage batteries from LG Chem would also work. Other companies are also developing lithium storage batteries for solar. But the nice thing about this inverter is that it would work fine out of the box without a battery, and as battery prices eventually come down, the battery could be easily added at a later date. The SMA Storage inverters are transformerless and thereby have the advantage of running a lot cooler. About 2% of the power in an inverter with a transformer is manifested as heat. Eliminating the transformer increases the inverter efficiency and decreases some of the need for cooling. Be the first to review “Sunny Boy Storage 6.0-US Inverter” Click here to cancel reply.